Apple makes it easy for your to put a ringtone on your iPhone as long as they make money that’s why the only option you see when you go to Ringtone is “Buy More Tones.” But don’t think the only option to put another ringtone in your iPhone is by buying more from iTunes, you can put a ringtone free and very easy using any song or audio MP3 file you have in iTunes. Just follow this easy process. 1. Open iTunes and locate the song or MP3 file you want to convert as a ringtone for your iPhone. 2. Right-click the song and select Get Info. 3. Now go to the Options tab. 4. Check the Start Time and Stop Time. In those two boxes put the time you want the ringtone to start and when to stop; the time must be 30 seconds from start to stop. As you can see, I put start at 0 second and stop at 30 seconds. 5. Click OK. Right-click the song again and select Create AAC Version. Now a new 30-seconds version of the song should show up in iTunes. Put this new 30-second version that was created in iTunes to a new folder or just drag it to the desktop. 6. Find the original song, right-click it, select Get Info and go to the Options tab again and uncheck Start Time and Stop Time. Delete the 30-second version of the song in iTunes. 7. Locate the 30-second version you just took out of iTunes and change the file extension from .m4a to .m4r by renaming it. Double click it or drag it to iTunes. Now the ringtone is created and is already in iTunes. You can check tones you have created and put in iTunes by going to Music\iTunes\iTunes Media\Tones. After creating the ringtone, now we want to transfer it and activate it on the iPhone. This is the easiest part. 1. Connect the iPhone and open up iTunes as you would normally do. 2. In the tabs where you see the iPhone summary, now you should see a new tab that says Tones. Go to that tab and choose Sync Tones and from there you can decide if you want to sync all ringtone or selected tones. 3. Click apply and the ringtones should now be synced to your iPhone. 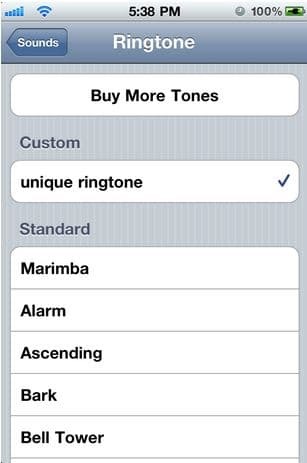 To activate the ringtones on your iPhone, go to Settings.app and choose Sounds and then Ringtone. In there all you ringtone should be under Custom. That’s all. But if your iPhone is jailbroken you don’t have to go through all these sh1t. All you would have to do is download AnyRing from Cydia.